Hermione, the ship that sailed "like a bird" according to the Marquis de Lafayette, is scheduled to make landfall in Yorktown, Virginia, less than two weeks from now. 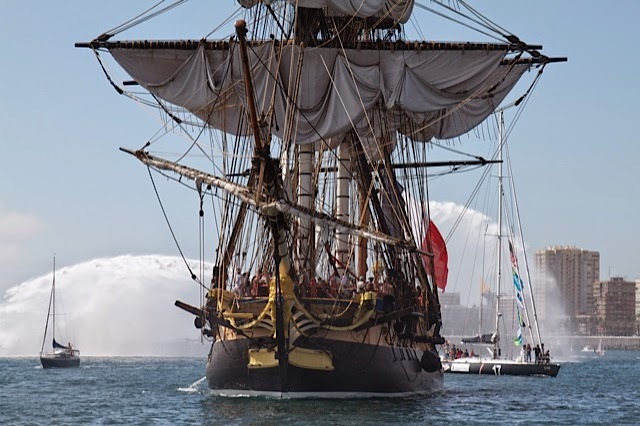 Her astonishing replica, that is, built in France and now recreating a voyage made 245 years ago. She set sail last month from Port des Barques, at the mouth of the River Charente, where Lafayette departed in 1780 after persuading the French King Louis XV1 to back the cause of American independence. Like the original, the reconstructed, three masted frigate was built in the former Royal Dockyard at Rochefort in the French Poitou-Charentes region. She measures more than 200 feet and has a mainmast towering 177ft above the bottom of the hull. Built of oak from French forests, she deploys 16,000 square feet of sail. One tonne oft oakum was needed for the caulking. Twenty six canon were installed. The ship is due in Yorktown from June 5 -7. After that she will sail up the north east coast of the United States, calling at Mount Vernon, Alexandria and Annapolis (all in Virginia), Baltimore, Philadelphia, New York Greenpot (NY) Newport (Rhode Island), Boston, Castine in Maine and finally to Canada and Luneburg in Nova Scotia. Dates and full details can be found on the project website. The Hermione will be back in Rochefort at the end of August.